Users of Carmarthenshire parks are being warned to keep away from wild parsnip, a weed that has a sap that can burn skin and cause a painful rash. Signs alerting people to the dangers of the plant have been posted around Llanelli Millennium Coastal Park and other parks in the county. Carmarthenshire council said there had been incidents of people being burned in recent years. Parents are being asked to warn their children of the risks. Discourage children from picking wild flowers. County countryside officer Simeon Jones said wild parsnip grew extensively on the coast and elsewhere in the county. "We control it as best we can near the discovery centre on the North Dock and other locations. We put up signs and let people holding events know of the risks," he said. "But on mown grass the rosette can evade mower blades and stay close to the ground and people have sat on it inadvertently. "We had a case in recent years where a family were affected at the North Dock and historically there was an incident at Pembrey country park. Neither party had seen the signs and were unaware of the dangers." 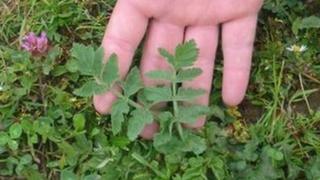 He said it was "impossible" to get rid of the weed, which was rampant around the country "like nettles and brambles". As well as parks, wild parsnip - from which modern cultivated parsnips are derived - can often be found in roadside ditches, around sports fields and along railway tracks. It comes into season towards the end of June and grows until September. The plants have chemicals called furocoumarins that can cause skin inflammation. The chemicals are absorbed by the skin and stimulated by ultraviolet light on sunny and cloudy days, destroying cells and skin.